For a while, it looked like Skyfall might not happen, as MGM's financial woes caused the film to be tabled, and some of the major players moved on to other projects. But no one has ever been able to keep James Bond down for long. Besides, resurrection and rebirth are among Skyfall's major themes. Thus it was that production resumed in January 2011 for a fall 2012 release. Pent-up demand may have accounted for some of the huge box office success, but there was another, more basic reason. The movie was good. Without reopening the debate over 2008's Quantum of Solace, that film always felt less like a standalone Bond and more like an answer to 2006's sit-up-and-take-notice Casino Royale, which both introduced a new Bond and successfully rebooted the franchise for the 21st Century. Not only did Quantum pick up the story immediately after the closing moments of Casino Royale, but, at a trim 106 minutes, it was notably shorter than either Casino Royale or any of the four preceding Bonds starring Pierce Brosnan. Even fans of Quantum were eager to see a Bond film that spread its wings and soared the way Casino Royale had. Skyfall delivered, and then some. Not only did it appear to kill off Bond in the spectacular pre-credit opening sequence—a maneuver that fooled no one, but that did have the bracing effect of reversing the usual formula, in which Bond typically succeeds in his pre-credit mission—but it also put Bond in the unaccustomed position of having to win back his MI6 spurs. And Skyfall gave us the single best Bond villain we've seen since . . . well, whoever happens to be your favorite Bond villain, in the person of Silva, the cyber-terrorist (among other things), gracefully incarnated by Javier Bardem, that specialist of evil, who has repeatedly said in interviews that as a boy he always identified with the villains in Bond films. It shows. What starts Skyfall rolling is a hard drive containing an encrypted list of all covert agents embedded with terrorist organizations. Someone has stolen it, and Bond (Daniel Craig, on his third outing) is leading a team in Istanbul to recover it. His chief support is a new field agent named Eve (Naomie Harris), who, on direct orders from M (Judi Dench), risks a shot at the operative who stole the list, a sleek assassin known as Patrice (Ola Rapace), and hits Bond instead. Bond plunges into a raging river and is presumed dead. Patrice escapes with the list. Cue an inspired credit sequence by Daniel Kleinman, whose idea was to imagine Bond's life flashing before his eyes, accompanied by the sound of Adele singing her Oscar-nominated title song. Three months later, the encrypted list has yet to be recovered, and M is being forced out of MI6 for having lost it. The bad news is delivered by Gareth Mallory (Ralph Fiennes), a government bureaucrat. But that very day, an unknown cyber-terrorist penetrates the MI6 computer network looking for decryption codes, and also manages to trigger an explosion that kills almost a dozen MI6 employees and injures many more. Bond, secretly recuperating from his wounds on a remote island, sees the news reports and resurfaces. But Bond finds that both he and MI6 have changed. The organization he once knew has retreated into an underground bunker last used by Winston Churchill in World War II. The new Q (The Hour's Ben Whishaw) is a skinny computer geek who, as Bond puts it, "still has spots". And Bond is no longer treated with reverence since his Lazarus-like return from the dead. Instead, M and Mallory force him to requalify in the most basic skills, including marksmanship, physical stamina and psychological stability. They're not wrong, either. Bond barely passes (if that). Clues from the Istanbul encounter allow Bond to track Patrice to Shanghai. The trail then leads to a casino in Macau and an exotically beautiful woman, Sévérine (Bérénice Lim Marlohe). Only then does the real adversary, Silva (Bardem), reveal himself and begin to unfold his true purpose, for which the encrypted list of covert agents was merely a tool. Since there are still those who haven't seen Skyfall, let's just say that Silva once worked for M, bears a grudge, and wants her to suffer. Bardem, who won an Oscar for his intimidating portrayal of the killer, Anton Chigurh, in No Country for Old Men, here creates a very different kind of villain: charming, flamboyant, a sociopath who takes a gleeful joy in his "work", whereas Chigurh never cracked a smile. If Chigurh was terrifying because he was inexorable, Silva frightens because he's entirely unpredictable. It's not that he's random exactly, because he always has a plan. But only Silva knows what it is. Some viewers have groaned at the realization that yet another Bond story turns on the discovery of a turncoat, present or former, or a double agent. They yearn for the days of a true Big Bad as a Bond villain, an Auric Goldfinger or a Blofeld. It is only fair to remind viewers that Casino Royale featured Le Chiffre, a financier to terrorist organizations, and Quantum of Solace was entirely about the mysterious organization known as QUANTUM, which recalled SPECTRE in its scope and ambition. As for the rest, espionage, since at least the Cold War, has always been about "turning" members of the other team, while guarding against those on your side being turned. In his very first Bond novel, Ian Fleming included a double agent that Bond did not discover until the final pages. Other, more prosaic writers of spy fiction have built entire works around moles and double agents, e.g., John le Carré's Tinker Tailor Soldier Spy. Silva, at least, was sufficiently enterprising to go out and build a massive criminal empire over a span of fifteen years before returning to take his revenge on M. He became what Bond might have, if, as Mallory suggests at one point, he'd chosen to stay dead. Skyfall's image on Blu-ray is spectacular: clear, sharp, detailed and noiseless. A great cinematographer can make anything look interesting. Skyfall's DTS-HD MA 5.1 track is more than equal to the obligatory big moments of a Bond film: the explosions, car chases and shootouts, not to mention the opening train chase involving a crane and various VW Beetles and a scene in the London Tube that recalls Die Hard 3. The sonic intensity of these sequences should satisfy any home theater action junkie, with their crisply defined surround effects, immersive surround field and deep bass extension. Commentary with Director Sam Mendes: Mendes provides a true "scene-specific" commentary, and it's obvious he's still very close to the process of making the film, as he recalls details of revising the script, shooting individual scenes (and revising key moments to incorporate suggestions from actors, especially Bardem), working with editor Stuart Baird and the contributions of various effects houses and other departments. Along the way, he provides valuable insights into his directing strategies, particularly in staging difficult moments like the film's emotional climax. Commentary with Producers Barbara Broccoli and Michael G. Wilson and Production Designer Dennis Gassner: This is something of a mix of the old and new guard, as Gassner only joined the franchise with Quantum of Solace, whereas Broccoli and Wilson are the second-generation keepers of the tradition. Shooting Bond: Whether viewed as a single documentary or as individual featurettes, this comprehensive overview of the production of Skyfall demonstrates what can be accomplished when a documentary crew follows a production from the beginning and then edits together the best material. Here you'll find input from most of the major department heads (with the notable absence of editor Stuart Baird), as well as the principal cast, the writers, the producers and director Mendes. For those who don't have the patience for commentaries, this is the place to learn how Skyfall was made. Skyfall Premiere: Scenes from the world premiere at the Royal Albert Hall, featuring interviews with Mendes, Craig, Harris, Bardem, Fiennes, Whishaw et al. Theatrical Trailer: As much as it appears to give away, there's so much more. Soundtrack Promotional Spot: With a brief introduction by composer Thomas Newman. The year is young, but Skyfall is already shaping up to be one of 2013's biggest sellers on Blu-ray. It hardly needs a recommendation, but here it is anyway. 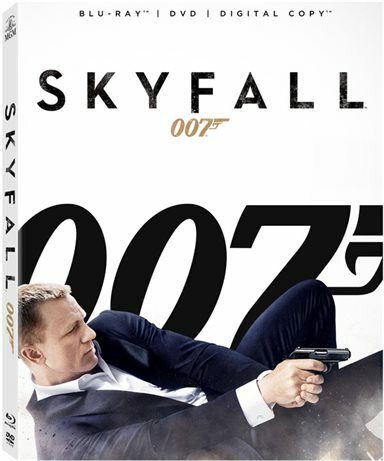 Whether you're filling that empty space in your Bond 50 set or just want to see Skyfall again in a first-rate presentation, this Blu-ray edition from Fox/MGM is a worthwhile addition to your library. Just be aware that, as with all things Bond, there will be future editions. (Yes, plural.) But buy this one now, and you can always wait to see what extras the others have to offer. It's hard to imagine that the audio/video presentation can get much better. Highly recommended. Download Skyfall from the iTunes Store in Digial HD. For more information about Skyfall visit the FlickDirect Movie Database.